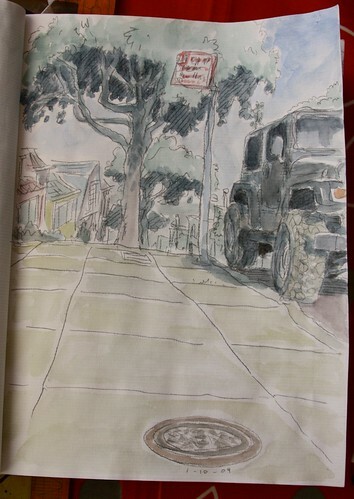 Home » Blog » WWSketchCrawl 21 report! Wow! 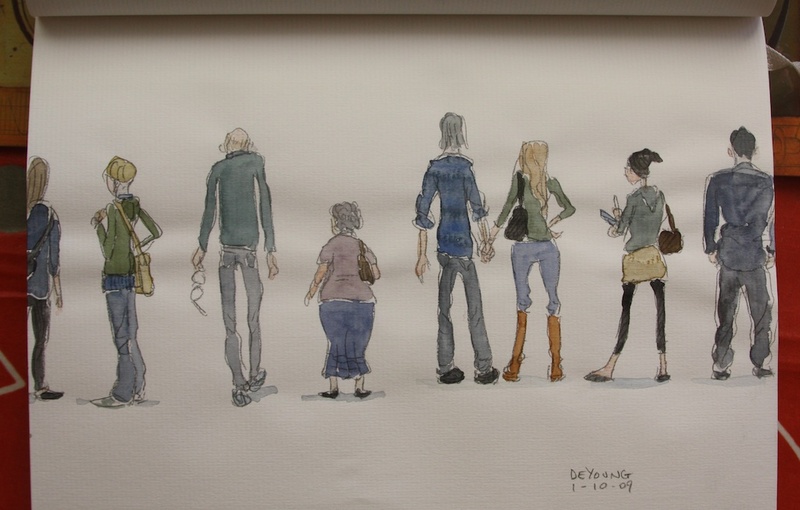 What a great sketchcrawl this past saturday! It was hands down the most attended with artists participating and gathering in more than 90 different locations around the globe. Don’t miss checking out all the drawings on the forums! It really still blows my mind that on these days we are soo many around the world drawing at the same time, it’s such a good feeling. A shout goes out to San Paolo in Brazil with a record 120 artists sketchcrawling there! Amazing! 🙂 In San Francisco we weren’t too far behind with roughly 100 artists participating. It was really fun seeing everyone at the De Young Museum at the end of the afternoon. 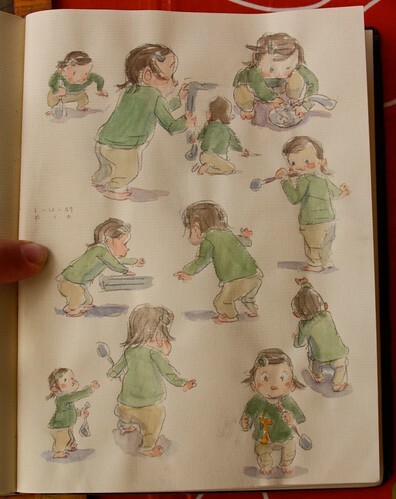 Below are my day’s watercolors. 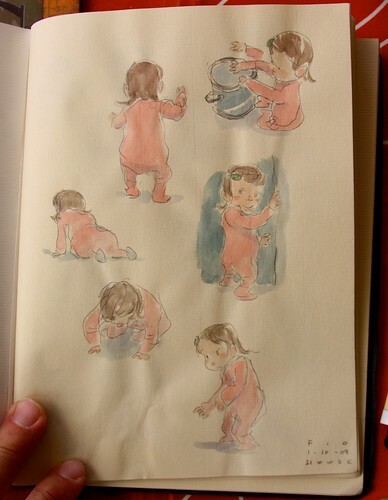 I started with sketching my daughter, whom I’ve honestly found for quite some time hard to capture. She’s so ridiculously adorable it’s hard to do it justice. These are among the first attempts I feel pretty good about. So, that’s it … and for next SketchCrawl early April! We’ll have a date asap! this is a wonderful idea, sad to say I hadn’t heard of it – where can I go see all the sketches? great day we had here in Mauritania and hopefully next one we’ll get some more artists to join and not only… I explained a bit of what it is about and i really would like to post your logo in my blog … how can I do it ? I would love to participate in my own area, but I didn’t find any way to track your blog. Is there a way that I can do that or get notification when new posts have been added so that I can join in on the next Sketch Crawl? 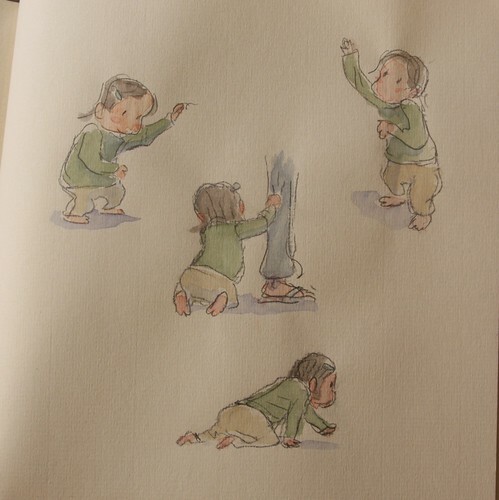 It was very nice meeting you in angoulme,thanks for the drawing and hope we can meet again…. Don’t know when or where but….We will see…. I`m animator from Argentina , and i would like to make an oficial Sketchcralw marathon here in my country. Quando ser o prximo aqui no Brasil? rsrs… Belo trabalho Enrico e Cia! where is tomorrow’s sketch crawl in san francisco? Hi! Love the idea of this and want to participate in the next upcoming SketchCrawl. Hoping Orlando has one of these lined up. I want to write a story about my experience and was wondering if you would like to be interviewed for Buzzine. I was also wondering if I could score one of those cool t-shirts. Email me if you are interested! Great sketches! I really like the line work and colors!